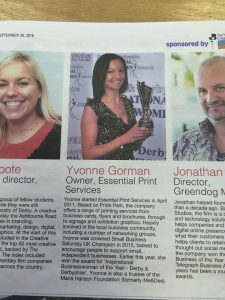 For the second year running, our very own Yvonne Gorman has been named by the Derby Telegraph as one of the 250 inspirational business people in Derby. How awesome is that? “It’s rewarding to be recognised for all the hard work I put into my own company, as well as helping to promote initiatives such as Small Business Saturday and PridePark.net. Five years on, my enthusiasm for print, business and my city has not waivered. I’m still as ambitious as I ever was, probably even more so,” commented Yvonne. “I’m so proud to be in the company of 44 other ladies in this publication. I know of plenty of others out there who should be recognised for their contributions too. So, to all the business owners reading this, don’t stand in the shadows, shout about your achievements from the rooftops. If you need help and advice, simply send me a message,” Yvonne added. 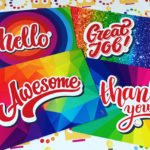 “Lastly, thank you to my team at Essential Print Services – to Lindsey, Katie and Lee for all their help to keep the print wheels turning whilst I focus on business growth and help others to do so too,” Yvonne concluded. Yvonne started Essential Print Services in April 2011. Based on Pride Park, the company offers a range of printing services – large and small – from business cards, flyers and brochures, through to signage and exhibition graphics. Heavily involved in the local business community, including a number of networking groups, Yvonne was crowned Small Business Saturday UK Champion in 2015, tasked to encourage people to support small, independent businesses. Earlier this year, Yvonne won the award for ‘Inspirational Businesswoman of the Year – Derby & Derbyshire’. Yvonne is also a trustee of the Maria Hanson Foundation (formerly Me&Dee).